Bent Creek is located in the northern tip of the Pisgah Ranger District of the Pisgah National Forest, just 15 minutes from downtown Asheville. Bent Creek's watershed contains a collection of trails for all kinds of hikes, for those suitable to beginners and families to those more amenable to advanced hiking groups. Chestnut Cove trail has been re-routed in recent years to include these nicely built switchbacks, easing the climb. 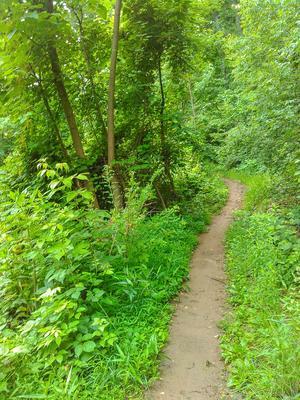 A recently cut section of forest along Little Hickory Top trail resembles a jungle in early summer. Bordered by the Blue Ridge Parkway to the south and a moderately high ridge to the north, this watershed is a federal Research and Demonstration forest, so you can learn more about forestry management techniques as you hike. This also means, however, that the forest is subject to research closures, so it is imperative for you to stay on the trail and out of the research areas. Backcountry camping is not allowed in the area for this reason. A campground, mountain lake, and family recreation area, combined with its close proximity to the city of Asheville, make this area very popular with tourists and locals alike - yet it is not as crowded as some may have you think. Plenty of miles of trails means the people will be spread out. This trail network is very heavily used by mountain bikers as well, so be sure to share the trail! 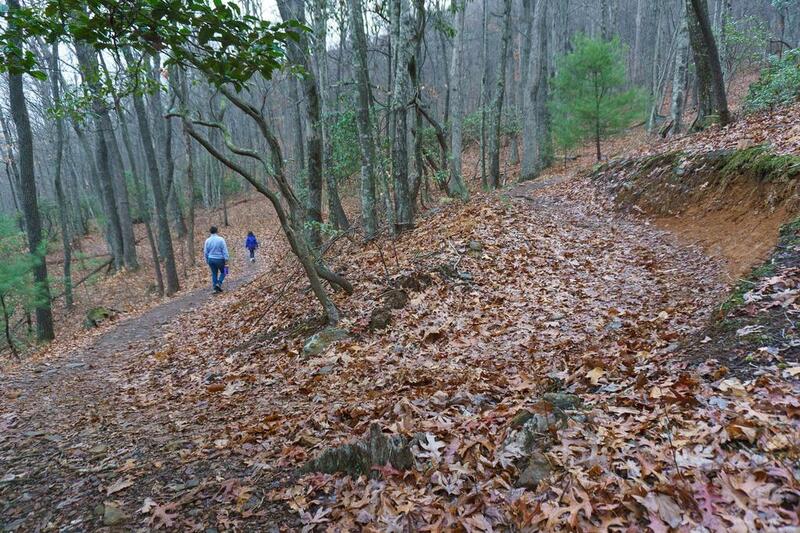 Bent Creek's trails are varied, like much of Pisgah. The area is bordered by the young Pisgah Ridge to the south and a moderately high side ridge to the North (including Stradley Mountain), with elevations ranging from about 2100' to a modest 4100', so there are no extremely long or difficult trails (unless you leave the Bent Creek Area itself). Most of the easier trails are clustered around Lake Powhatan, where several loop trails - Deerfield Loop, Pine Tree Loop, and Explorer Loop (in order of increasing difficulty) make nice, short family hikes. The Homestead trail (which loops around the lake) and Campground Connector trail are two other excellent easy trails near the lake. Some easy hikes are possible from the Rice Pinnacle area as well, by including the Wolf Branch, Deer Lake Lodge, and Ledford trails. More difficult trails on the north side of Bent Creek Gap Road include Sidehill, Lower Sidehill, and Little Hickory Top. Connecting trails make loops of various difficulty possible on this side of the road. Sleepy Gap is a trail with a more decent climb on Bent Creek's south side, and its upper portion is hiking only as it reaches up to a Blue Ridge Parkway overlook. You have even longer-distance options available that start in Bent Creek, as well. Near the mouth of Bent Creek as it dumps into the French Broad River is the beginning of the Shut-in Trail, a section of the Mountains to Sea Trail with which it is co-signed, which ascends Shut-in Ridge and generally follows the Parkway all the way to the Mount Pisgah parking area many miles to the South. This is the most strenuous of Bent Creek's trails. The Mountains to Sea Trail continues in both directions at each end of the Shut-in Trail. This dual trail follows the southeast border of the Bent Creek area and several of Bent Creek's trails intersect it, including Hardtimes Road and the Sleepy Gap trail, making long distance hikes into the Mills River and Davidson River areas to the south possible. 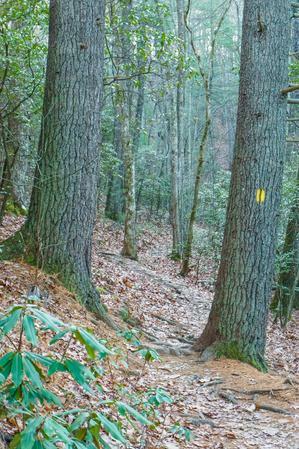 You can also access this trail from the Blue Ridge Parkway at the French Broad River, Sleepy Gap, Bent Creek Gap, and Beaverdam Gap overlooks and thus hike downhill into the Bent Creek area. Curve on the Wolf Branch trail just east of the Ledford trail junction. This is just an overview of the hiking available in Bent Creek. 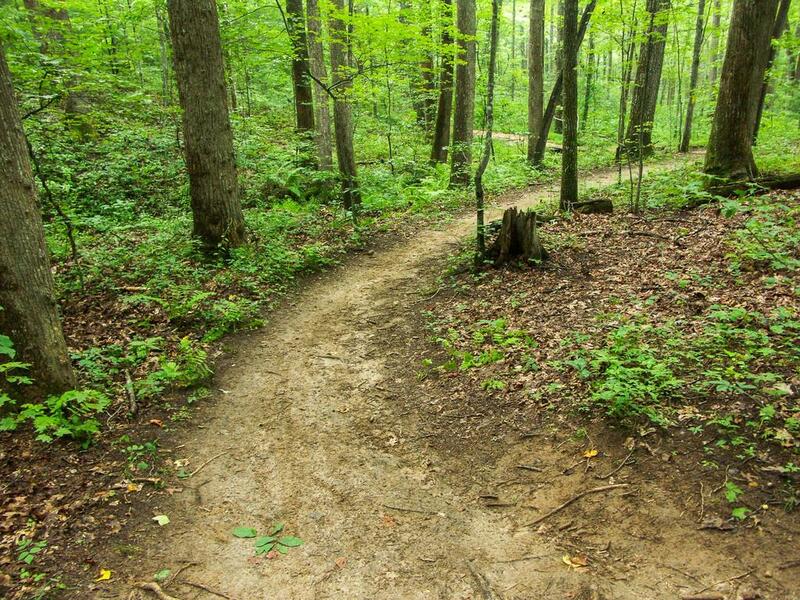 Visit the Bent Creek trails page for all the details about each trail. Here's a map of the Bent Creek area. For more maps, including printed publications, see our Bent Creek maps page. Unlike much of Pisgah National Forest, backcountry camping is not allowed within the Bent Creek area and there are no longer any roadside campsites. However, the Lake Powhatan Campground is located within the Lake Powhatan Recreation Area at Bent Creek. Open year round, this nice campground offers 98 sites, flush toilets, and hot showers, all near the shore of Lake Powhatan which includes a swimming beach and fishing pier. You can also walk right out of the campground onto Bent Creek's fantastic trails. The campground can become quite crowded on summer weekends. Offers the perfect place to stay for your Western North Carolina hiking adventure. The inviting lodge is located in a section of forest between the Blue Ridge Parkway and the French Broad River. You can easily bike or drive from the Lodge to the Bent Creek Recreation Area. The North and South Mills River areas are just a short drive down the road, and the Davidson River area and Dupont State Forest are only 45 minutes away. After a long hike you can come back to the Lodge, soak those tired muscles in a whirlpool tub and head for the night life and great restaurants in Asheville, only 15 minutes away! Click here for more information on the Bent Creek Lodge. From Asheville, take I-240 west to I-26 east to exit 33, NC 191. Turn left, pass the Asheville Outlets, and continue south on NC 191 for 2 miles past the exit ramp. Turn right at the stoplight onto Bent Creek Ranch Road (following the brown signs for the Lake Powhatan Recreation Area). Bear left at a fork after 0.2 mi on to Wesley Branch Road. Continue for about 2 miles past the Wesley Branch Road fork to reach the National Forest and the first parking area (Rice Pinnacle) on the right. About 0.5 miles past Rice Pinnacle on the left is the Hardtimes trailhead. Many hikers start there, but it can fill up on nice weather days. 0.2 miles beyond the Hardtimes parking area, the road splits. The left fork leads to the Lake Powhatan Recreation Area and Campground, open seasonally, where an entrance fee is charged and parking is available. The right fork is a gravel road, and called Bent Creek Gap Road (FS 479), which eventually leads to the Blue Ridge Parkway. At the intersection with Ledford Branch Road (FS 479E) in 0.1mi is developed parking area with pit toilets. Several good free parking areas are farther along FS 479, particularly at Boyd Branch and Laurel Branch roads.